Winter is really the season for the evergreen trees. There’s nothing like the beauty of snow-covered pines, spruces, firs – they are the stuff of winter landscape! 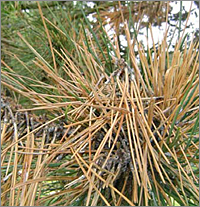 This brings me to a common disease of pines – Diplodia tip blight, caused by the fungus, Diplodia pinea. Austrian pines are particularly suspectible. If you’ve seen an Austrian pine tree, you’ve probably seen clumps of brown needles – that’s likely the work of the fungus. Austrian pines are often planted as street trees in this part of the country because they are tolerant to the road salt used for winter ice/snow control. PhD candidate Patrick Sherwood and Professor Enrico Bonello in the Department of Plant Pathology are using the Diplodia-pine system as a model to study plant defense against pathogens. They are delving down to the biochemical and molecular levels to study the complex, intriguing interactions between plant and fungus. Many students are surprised to discover that plants indeed mount a defense response against pathogens. It’s not the same as the immune system of humans and animals, but there are key similarities as well as differences. The use of disease resistant plants or crops is a cost-effective, environmentally sound management strategy. An ounce of prevention is worth a pound of cure – that’s especially true for plants. Santa Claus and Flying Reindeer – A Magical Mushroom Connection? Some (many) fungi produce potent toxins and hallucinogens. It’s really serious, ranging from aflatoxins (potent carcinogens) and ergotamine (a tie to the Salem witches?) to potential mycotoxins produced by pathogens of corn, wheat and other staple food crops (More info). Some think the story of Santa Claus and his flying reindeer may have ties to the shamans of Siberia and Arctic, long ago. Amanita mushrooms, the well-known red and white magical (hallucinogenic) mushrooms of the forest, were known to be consumed by the tribes people of the region and delivered by the shamans as gifts around Christmas (note: these mushrooms are toxic, do not consume these or any fungi you find outdoors). Hmmm. 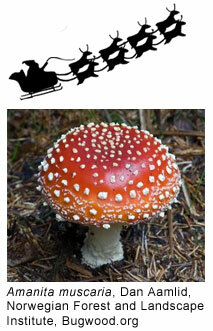 Shamans delivering gifts of red and white magical mushrooms at Christmas? Flying reindeer – were they just high on mushrooms? Several changes are afoot. Chestnut blight (a plant disease) has wiped out the majestic chestnut trees, which used to blanket forests with bright yellows and golds in the autumn. Hemlocks are threatened by the woolly adelgid, an invasive insect. Drought and land use are also changing the forest landscape, exacerbated by a changing climate. 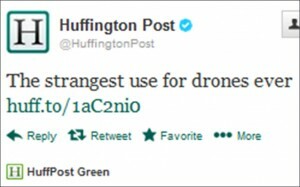 This recent tweet by Huffington Post (right) caught my eye. I was surprised to find out it was a story about plant pathology research led by alumni Kirk Broders (PhD Ohio State, Plant Pathology) and his PhD student, Matthew Wallhead (BS and MS, Ohio State, Plant Pathology), now at the University of New Hampshire. Broders and Wallhead are developing an unmanned aerial vehicle (UAV) – AKA drone – to scout orchards for a serious disease, apple scab. Broders hopes to develop a smaller, more affordable device to detect diseases and other problems. The development of aerial devices in plant disease management isn’t entirely new, but this particularly story is getting a lot of attention in the press. On our Plant Pathology Facebook page, it is by far our most popular post in recent months. Although Broders and Wallhead are careful not refer to their device as a drone, it’s certainly hooked a lot of people. Drone, unmanned aerial vehicle, remote control imaging device. In the world of Twitter and newsfeeds, headlines do matter. I hope you’ll click through on the link and learn a little bit about what the work of plant pathology. Now that’s what really matters! Bioterrorism: An Overview is a course offered by the Department of Plant Pathology this spring (PLNTPTH 4550/INTSTDS 4550). At first glance, you might not connect Plant Pathology to bioterrorism, but we do work with pathogens, and pathogens of humans, animals or plants are very serious concerns to food security and food safety. The course is taught by Mike Boehm, Vice Provost for Strategic Planning, Special Assistant to the President, Professor of Plant Pathology, and former Naval Reserve Lieutenant Commander. 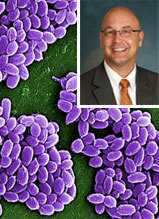 After 9/11, while on the faculty of the Department of Plant Pathology, Dr. Boehm was placed on active military duty, where much of his work centered on bioterrorism agents such as anthrax. He brings this first-hand experience to the classroom, along with his passion for teaching. Taking a class from Dr. Boehm is on the list of special opportunities for students at Ohio State.